We just put another notch in the growth timeline for Backwater Paddle Company. First Road Trip!! This past weekend (May 13/14th) we went up to Tallulah Falls, Georgia to a kayak fishing tournament we had helped sponsor. The Georgia Kayak Fishing Club put together a four leg tournament that winds through all the beautiful Georgia countryside lakes and streams. Kurt and I wanted to get our feet wet with a kayak fishing tournament that was close to home. Not having any idea what to expect, our trip was relaxed and fun. We camped at Moccasin Creek on Lake Burton, about 25 miles from the event. (Note: that is what happens when you wait until the last minute to make reservations!) Nevertheless, we rolled with the local anglers and vendors that showed up for the event. Hats off to Tony Narcisse of the Georgia Kayak Fishing Club! He was the point man with this kayak fishing tournament. There were about 3 dozen kayak anglers that vied for the main prize, a dressed out fishing kayak by Ocean Kayaks. The Predator and Piranha Kayak Fishing Hand Paddles made their official debut. Those who recieved a Piranha paddle prior to the actual tournament, and used it throughout the tournamnet, were ecstatic about the paddles and their fishing performance. Tony put everything together for this fine event. The only thing he forgot to address was Mother Nature. She visited with a vengeance!! Unfortunately a torrential rainstorm, dumping hail and providing gale force winds, put a damper on the awards ceremonies. Thankfully, that storm waited long enough for all the local anglers to get their business done and present their measurements at the weigh in. Once that storm rolled in, everyone scattered for higher and safer ground. We never did see who won our Predator and Piranha Kayak Fishing Hand Paddles. At that point, quite honestly, we were more concerned about our campsite some 25 miles away. We are waiting on the kayak fishing tournament results, information and pictures from Tony and the GKF club to post on our site. In all my excitement, it was an afterthought in snapping photos. Next time! Give us a break…we were overwhelmed with what was transpiring all around us! That storm forced Kurt and I to bail from our campsite at around 7 pm and make the 10 hour drive to Central Florida through the mountains, at night and while raining. Thank God for the Tom-Tom or Garmin, whatever we had…with the GPS tracking! Kurt was able to provide real time road directions as we coursed our way through the winding, rain soaked, pitch black mountain roads. This was our very first road trip, but more so than anything, it was also our “first rodeo!” Boy, did we ever learn from this experience! We can not wait for the next kayak fishing tournament! The “River Bassin Trail” Tournament, hosted by Kayak Fishing Pro Drew Gregory, and presented by Bass Pro Shops, is next. June 3rd, Birmingham, Alabama…here we come!! This entry was posted in Backwater Paddle Products, Marketing My Company and tagged kayak fishing, kayak fishing hand paddles on May 21, 2010 by Paddleman. Starting Backwater Paddle Company has been with out a doubt, the biggest challenge in my life. I entered the paddle sports market with nominal business skills, minimal manufacturing knowledge and zero national marketing experience…yet I never blinked, nor balked, when I started on this endeavor. Failure was never an option. Having spent most of my adolescent life with the US Navy and in some precarious positions, identifying problems and providing solutions has been paramount to my survival and success. Since retiring from the Navy, applying these concepts to my daily life has put me down challenging paths. I would have it no other way, either. Nevertheless, success was not measured by what I could do by myself. Being successful was defined by how I and our team managed to achieve our goals, together. Survival is a personal fortitude. Personal success however is not just surviving, but setting and achieving challenging goals. Surrounding your self with like minded individual’s hell bent on achieving their goals, despite any and all obstacles, will make you successful. Backwater Paddle Company, despite tough economic times, has survived. Not only has it survived, it is growing and flourishing. This has NOT happened at my sole expense, but through a collaboration of another like minded individual, totally devoted and hell bent on making this company work. Kurt Horn, CPM (Chief Paddle Maker), has been the other half of this dynamic paddle company duo. Without Kurt, Backwater Paddle Company would still be a struggling paddle sports entity. However, Kurt, a professional cabinet maker and wood worker, provided proof from an inspiration. On his own initiative, he took a hand drawn concept and delivered a working model, the prototype of the Predator Kayak Fishing Hand Paddles. This innovative hand paddle prototype is the backbone, the legend, the existence of Backwater Paddle Company and its future moving forward. A kayak angling dilemma was presented. A simple idea was designed and Kurt provide the ultimate working solution. The evolution of the Predator Kayak Fishing Hand Paddle proved there was a problem in the kayak fishing community and Backwater Paddles had the answer. Inspired, Kurt conceptualized and designed the Piranha Kayak Fishing Hand Paddle. 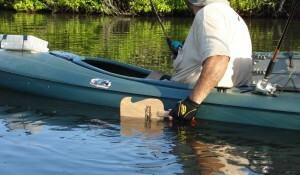 He provided another viable fishing hand paddle to solve the kayak fishermen’s dilemma. Kurt has selflessly devoted hundreds of hours into this paddle sports project. He has personally made EVERY kayak fishing hand paddle that has left the shop! He is involved in all research and development, every manufacturing decision, material testing, ordering and quality assurance. What has Kurt earned from this? Well the first thing Kurt will probably tell you is success is not measured in what you have today, but what you will have tomorrow. Kurt is in this project for the long run. Kurt understands the sacrifice, devotion, and the long hours working in the shop to achieve a common goal. The payoff is in the future. Has Kurt ever complained? Has Kurt ever slacked? NEVER!! Kurt is at the paddle shop between 5am – 6am daily, busting out more paddles till late afternoon. Kurt is relentless in the pursuit of perfection. This is why every paddle leaving our shop is flawless! He would have it no other way!! I could not have possibly moved Backwater Paddle Company to where we are today without having Kurt at my side. In one year, we have gone from relative obscurity to the front pages of the kayak angling community, worldwide. We could have never imagined the acceptance and success these kayak fishing hand paddles have created. Not only here stateside, Backwater Paddles presence is spreading throughout Australia, New Zealand, Canada and Wales. Who would of thought? It is an honor and pleasure to work along side Kurt. Kurt Horn is Backwater Paddles. Thanks Kurt!! This entry was posted in Backwater Paddle Products, Marketing My Company and tagged kayak fishing, kayak fishing hand paddles, kayak paddles, paddle sports on May 9, 2010 by Paddleman.